Naples in southwest Florida -- as well as Bonita Springs and Estero -- has a whole lot women love: wide walkable beaches, trendy shopping grounds like Waterside Shops, Coconut Point and the Mercato, plenty of restaurants and some of the best women-friendly golf courses in the country. 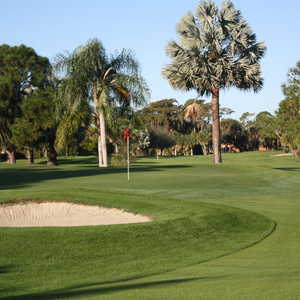 Raptor Bay Golf Club in Bonita Springs is one of the area's most women-friendly courses. Women power: An Audubon International Gold Certified Signature Sanctuary course, Raptor Bay Golf Club lies adjacent to a preserve where deer, birds and other wildlife live in a rich landscape of palmettos, flowering shrubs, pines and waving grasses. In excellent condition with fast undulating greens and plenty of lakes and wetlands, Raptor Bay's big plus for those who love the outdoors is the lack of housing along the fairways -- you really feel like you are getting away. And a big perk for those who struggle with their sand wedges -- there are no traditional bunkers, just waste areas and paths filled with crushed shells. You also get a lot of roll with hard fairways. That's power! Playing 5,030 to 6,702 yards, Raptor Bay has five sets of tee boxes, the forward two tees rated for women. There are two nines (Hawk and Osprey) that return to the clubhouse, so it makes it easy to play just nine. After golf: The Coconut Point mall is nearby with its upscale shops, and the Hyatt Regency Coconut Point Resort and Spa makes a great watering hole or a place to stay. 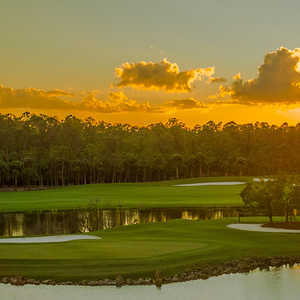 Women power: As a parkland-style course, women find The Naples Beach Hotel & Golf Club easy to walk, with short distances between greens and tees, and at 5,142 yards from the forward tees, not too long. You drive on crushed shell paths over mostly flat fairways that are almost at sea level. The highest elevations are the tee boxes. 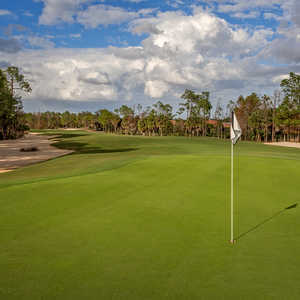 Very "Old Florida," the course charms with its ponds, huge-footed banyan trees, palms, flowering oleanders and hibiscus. A good number of resident birds live here too, including colorful Muscovy ducks that hang out on pond's edge on the second hole. Dating from the 1920s, when the hotel across the road was a gathering place for the wealthier set that came to this remote hideaway for some R&R, the course was renovated by Mark Mahannah (1948) and later by Ron Garl, a world-class golf course architect. There are three par 3s that require carries, but all hover around 100 yards. The 18th, an S-shaped hole, is a double dogleg with water on both sides. It's a challenging and fun way to finish your round. After golf: Across the street are Vanderbilt Beach and The Naples Beach Hotel. It's comfortable and one of the more affordable beachfront hotels in Naples. HB's On the Gulf, the resort's signature restaurant, offers small plates along with fare for bigger appetites. It's a perfect place to watch the sun go down. Women power: Quail Village Golf Club is short but a real gem, especially for ladies who aren't afraid to be challenged by some water hazards and come armed with ball retrievers. Friendly to walkers and reasonably priced, Quail Village trails through a community of more than 300 older but well maintained homes. This lush, lovely and well maintained layout is punctuated by several flower gardens, and you get free relief if your ball happens to land in any of them. When you first look at the scorecard and see yardages ranging from 3,707 to 4,873 yards and four tee boxes, you might think, "Hey, I can play from the tips." Think again. You'll need to fly your drive 180 yards from the blue tee to carry the pond on the third hole. From the red tee, the carry is 100 yards. And there are other challenges. This course has a lot of water, so play from the right tee and you'll have a blast. After golf: Cool off in the pool adjacent to the snack bar and modest-sized clubhouse or drive a few minutes to the trendy Mercato mall off Route 41 with its outdoor cafes and boutiques, and later dine on creative flatbreads and pretty parfait desserts at Seasons 52 restaurant. Women power: You've gotta love a course that has seven tee boxes, including four tees ranging from 3,438 to 5,515 yards all rated for women. One of the most popular plays in Naples, this public track gets a lot of use yet still manages to stay in pretty good condition. Stoneybrook Golf Course first opened in 1999 and was renovated in 2010, but that didn't change the amount of water hazards you need to negotiate. Still, with wide landing areas, a relatively flat terrain and large waste bunkers, you have good bailout potential. Perhaps best of all is the design by Zed Azinger and Gordy Lewis. It's solid gold with really no silly holes. The front nine warms you up for the back nine's "Talon's Grip," four devilish tests that are fun to play (holes 11-14). GPS-equipped carts and friendly rangers help keep the traffic flowing, so there is no way the men's foursome behind you can blame slow play on the women ahead. Rangers know. After golf: The Miromar Outlets are nearby. Calvin Klein, ECCO, Crocs, Bloomingdale's, Brooks Brothers, etc. Need we say more? Women power: Ladies who like to save a penny will appreciate the affordable green fees at Riviera Golf Club, an executive style course (3,411 to 4,249 yards) where you get a lot for your dollar. Opening in the mid 1980s, Riviera Golf Club was renovated in 2003 when tees, bunkers and greens got a facelift. Whether you are walking or riding, this course with its tree-lined and generous fairways is the place to come if you want to play in three to four hours. It's a pretty straightforward layout with some water, a sprinkling of bunkers and a handful of doglegs. It's especially good for beginners, juniors and average golfers, but there are holes that allow longer hitters to use their woods. After golf: Visit Naples Botanical Garden, a tranquil setting with an incredible collection of gardens and often the venue for outdoor concerts.